Navigation: Home / Forums / Wii U / What do you think the future of the Wii U will be? Topic: What do you think the future of the Wii U will be? I know exactly what you mean. These next generation i-tweens really annoy me....My brother is another who falls into this category, plus he's addicted to that horrible reality TV garbage that's sucking the imagination out of the air waves. It's pretty depressing....Actually very depressing. Another brilliant reason why i can't stand the 2000's. 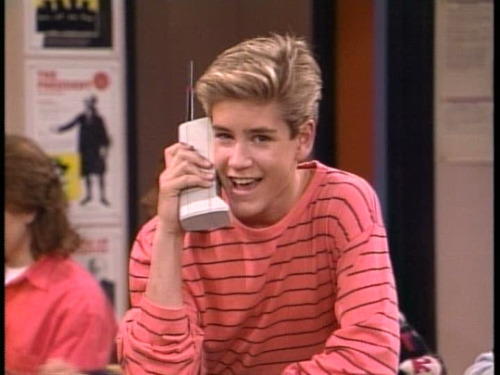 I say screw the new and get with the Zack Morris old. I want one of these bad boys haha. I'm into collecting 80's merchandise and the like so this is definitly something I'd try to score off eBay. I think Nintendo is safe. They have a dedicated fanbase...that sometimes wishes they would go bankrupt for various reasons (like the lackluster e3 presentation). If Nintendo ever decides to announce some awesome games for it, then it should be amazing. @Wavesta at least you could get some decent service with that brick back in the day I drive 10 minutes out of town and my service drops off completely yet they allegedly communicated with a group of dudeski's that went to the moon in the 60's... What's that all about? I'm expecting the to come either in first or 2nd place this time around. Not expecting it to do wii numbers again. My biggest thing is I this k Nintendo needs to aquifer a few more devs to have a more diverse platform. Pick up someone like Mistwalker for example and put a developer like Brownie Brown on more projects in the 3DS/download space. It seems nintendo teams are becoming stretched thin even more so than last gen. Sony has shown the. Benefits of having multiple really big developers and Microsoft seems tl be following that approach for next gen.
Nintendo needs to pick up one of the smart phone specialists. Even if Nintendo doesn't want to do smart phone stuff itself, it could really use some strategic advice from a specialist who does low price/ freemium gaming day-in-day out for its 3DS/ Wii U eShop. Gamevil would be a nice pick up for Nintendo. I don't care what place the Wii U comes in this generation just so long as two things happen. 1. It gets most of the multiplatform games that PS4 and 720 get. 2. It doesn't tank like the Dreamcast. Good games are all I am expecting. HD graphics are there. A good controller is there. A nice launch lineup is there. All we need now is Zelda, Metroid, Kirby, Donkey Kong, and Starfox and obviously great third party games. With the exception of the Virtual Boy, hasn't every Nintendo console made a profit? Even the GameCube made money because they were able to minimize manufacturing costs and sell each unit for a profit, unlike the competition. Well it's a year into launch and with modest November sales and no software hitting again until DKC end of Feb 2014, the future looks uncertain again. I think the best that can be hoped for is a humble bumble. The Wii U will be there for 2014 much as it was this year, and maybe sell a few hundred more with Kart and a again with Smash but all told less than a million between them. Holiday 2014? Triple what this holiday has done so far. With unimpressive sales from year end 2013 I really wonder at how nintendos development schedule is going to change. Can they really go full steam as if the WiiU was selling much much more? Nintendo can be happy if the WiiU hits 10 million by the end of its second year. Thats like a best case scenario. 8 - 9 is more likely imho. After 2014 Nintendo will go into life support for the U and will release like 2 - 3 great games per year. By 2017 latest the next Nintendo Console will be released. I think none of the current consoles will be able to match the numbers of the previous generations - not that I think gamers are going to decrease in number, but I don't see many non-serious gamers (actually a huge portion of the audience) upgrading their machine just for the sake of it. The direction the industry is taking...I don't see really anthing that can compete with experiences such as playing online multiplayer for the first time, or having games that could be expanded via DLC, or playing with motion controls (these are all experiences that the general audience has experienced during the last generation for the first time). Nintendo is going to be fine because they're an expert company that has many ways to make profit. For every penny they have lost on Pikmin, they have made ten with Animal Crossing. If WiiU doesn't sell, 3DS makes up for it and so on, so I'm not worried at all. This goes beyond just having "hystoric IPs" or making "brilliant games" - Nintendo knows how to use money in a wise way. I don't know if it's going to sell more than this and that company but that doesn't matter as long as they make a good profit. I mean, Capcom has sold more than most software houses during the 7th gen and it's still in the red - that means it's not how much you sell but how much you spend. I hope Nintendo teams up with Sony, like they almost did back in the day. Can't think of any downsides apart from it annoying some fanboys (oh wait, maybe that's an upside). I guess Nintendo's too stubborn to do it, though. They can pull the plug on the console the day after Bayonetta 2 is released, I won't mind.